The MeeGo-powered Nokia N9 comes with an all-new HTML5-enabled browser – a crucial piece of software for the Finns, who failed to deliver a contemporary browser in Symbian^3, at least before the Anna update. Maybe that's the reason why Nokia picked “the browser that doesn’t annoy me” motto for the browser in the N9 and to a certain extent it seems that the company has succeeded with meeting this goal. There are three ways of using the browser: you can just type in addresses, pick them from your bookmarks or tap a shortcut from the launcher. It supports pinch-to-zoom and double-tap to zoom, as well as increasing the font without affecting other elements. But the biggest downer is the lack of Adobe Flash support. 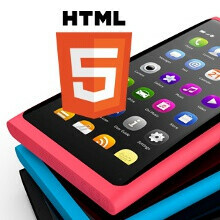 You'd have to completely rely on HTML5, which might be good in the future when the standard gets widely adopted, but currently a big part of the web is in Flash. Luckily, though, YouTube already delivers content via HTML5 and the N9 browser makes use of that. 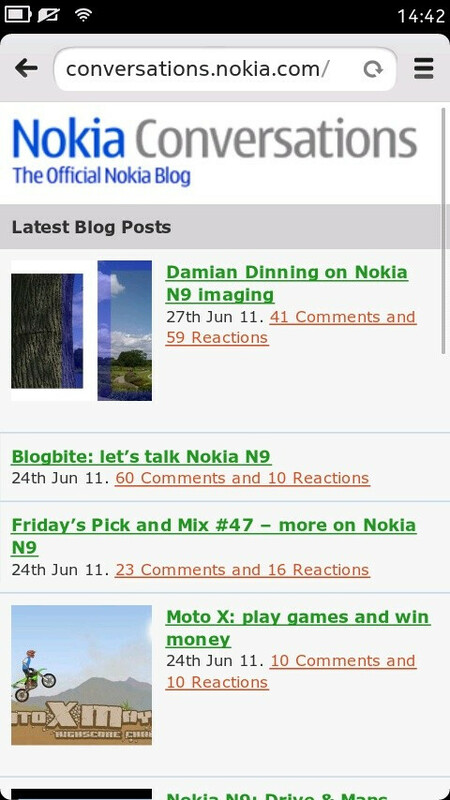 Check out the screenshots below and don't hesitate to share your feelings towards Nokia's decision to go Flash-less! What does that suppose to mean? Android at this very moment is flash AND HTML5 compatible. Why is it bad that Android has more features? I don't know about you, but I'm getting annoyed and tired of hearing Nokia boast about their MeeGo powered phone that they aren't even going to develop or support further come WP7 transition. Agreed, specifically since their targeting out the fact that it is a Meego powered phone and they're no longer supporting it. It's just hard work, facts and boasting all going down the drain. I get it!! it's an apple-wing website... so it will support all kind of moves that apple was done, is doing, and will do... even a move from a former enemy (maybe future though)... the enemy of your enemy is "my friend"
Did you even read the article? "But the biggest downer is the lack of Adobe Flash support. You'd have to completely rely on HTML5, which might be good in the future when the standard gets widely adopted, but currently a big part of the web is in Flash." 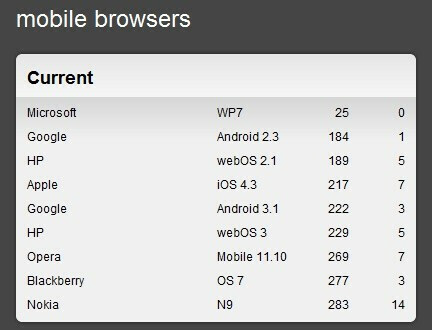 I totally don't get this, after like limitless reviews that I've watched, WP7 always comes out on top with the fastest frame rate - specifically when compared to iPhone RIM and Android... I really don't think that charts right haha. It doesnt matter since meego us getting killed off right? How about this? Make it compatible with Flash, just not installed? And if the user wants to use Flash they just install it? I get what Lucas777 is saying. I've been saying if folks want HMTL5 to be the standard, start phasing out Flash. At the same time I like that I have the option, the choice to use Flash.